Shanghai SIPG named Vitor Pereira, Andre Villas-Boas' assistant coach at Porto, as its new manager, who promptly set sights on a title. Vitor Pereira is officially introduced as the new manager of Shanghai SIPG by club president Zhang Min in Shanghai on December 12, 2017. 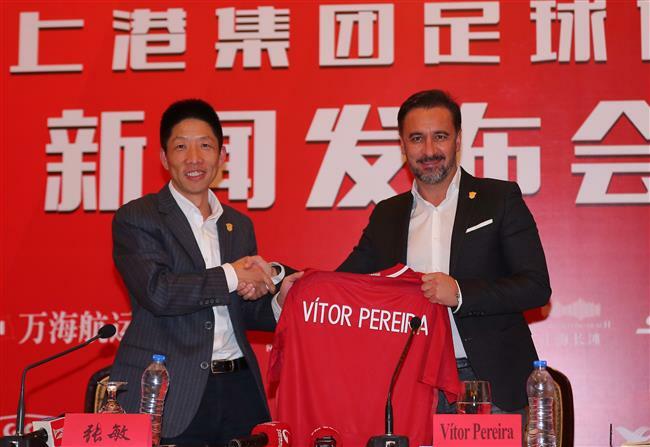 Shanghai SIPG’s newly appointed manager Vitor Pereira hopes to go one better than his predecessor, saying that he wants to bring the club a "well deserved" title next season. The 49-year-old Portuguese was assistant to former SIPG boss Andre Villas-Boas at Porto during the 2010-11 season. AVB left the Chinese Super League club two weeks ago after failing to win one "mandatory" title during the 2017 season. “I’m happy to join this fantastic family. I’m sure we will reach our targets at the end of the season,” Pereira said at a press conference in Shanghai on Tuesday afternoon, during which he was officially introduced as the new manager by club president Zhang Min. Pereira said he had not talked with Villas-Boas about SIPG yet, though he does plan to communicate with his friend and predecessor when he returns to Portugal next week. “The Chinese league is a big challenge at the moment as a lot of good coaches and good players are currently here… We will fight for good results and quality football, and of course for titles, because that’s what this club deserves. “We will keep some Chinese staff who are important to the club at present. But I’ll also bring some staff who have worked with me for a long time,” Pereira added. Pereira was No. 2 to Villas-Boas at Porto in the 2010-2011 season and together they won the Portuguese League, Cup and Europa League. Villas-Boas subsequently left for Chelsea and Pereira took charge of Porto, lifting the Portuguese League twice, before spells in charge of al-Ahli in Saudi Arabia, Olympiakos in Greece and then Turkey's Fenerbahce. He last coached at TSV 1860 Munich in the German second division until the team got relegated in May. Pereira was assistant to Andre Villas-Boas at Porto during the 2010-11 season. Pereira has already worked with SIPG top scorer Hulk back in his days in Porto. “I was with Hulk at Porto for three years and I know the personality and the quality of the player. For sure he will help us a lot, but the key player for me is the team,” said Pereira. Despite spending generously on big-name players like Hulk and fellow Brazilan Oscar, SIPG failed to pocket any title in the 2017 season. It got eliminated in the semifinals of the AFC Champions League, finished runner-up to Guangzhou Evergrande in the CSL and lost to city rival Greenland Shenhua in the Chinese FA Cup final. SIPG players are currently on holiday, and will gather on December 27 before heading for winter training abroad.